Gardening is truly a labor of love. Here are some of the best low-maintenance perennials for fall ~ short on labor, seek long on love! 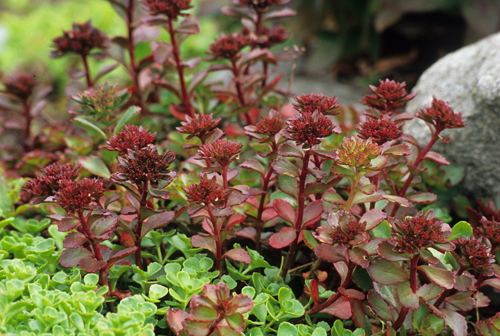 Sedums are succulent perennials that are native to many parts of the world. Use the smaller varieties in rockeries, health as ground covers, green roofs, in containers and hanging baskets, or even in a wreath. Larger varieties are great in borders or containers. Most appreciate full to part sun with only occasional watering once established. Well-drained soil is a must! PLUS: Flowers often attract bees and butterflies. Disease & pest- free! There are all kinds of reasons to add ornamental grasses to your garden. They offer four-season interest, wave in the wind, add great texture, and are compatible with shrubs and perennials. PLUS, maintenance is a breeze! Deciduous grasses are the grand dames of fall. They add beautiful texture and movement and come in a variety of heights. Clean them up in early March by trimming to about 6” from the ground, being careful of any new emerging growth. Most are heat & drought tolerant and do not need fertilizing. 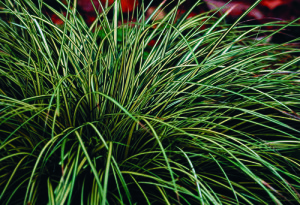 *Exception: Hakonechloa macra, Japanese Forest Grass likes rich, moist soil. Evergreen grasses (usually carexes, festucas or ophiopogons) are more shade-tolerant and rarely need cutting back unless frost/sun damaged. You can pick out the spent blades by ‘combing’ thorough them.